HISA has won the bid to host MedInfo 2021 in Sydney! The decision was announced in Hangzhou, China, yesterday during MedInfo 2017, the 16th World Congress on Medical and Health Informatics hosted by IMIA, the International Medical Informatics Association. 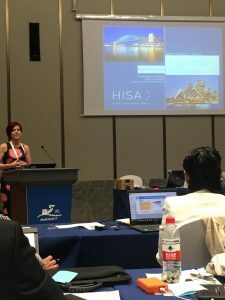 HISA CEO Dr Louise Schaper presented the bid with Renee Hall, from Business Events Sydney, supported by an Australian contingent including board member Phil Robinson and Victoria committee member Dr Mark Merolli. Her presentation included a pitch video with major contributions from leading Australian digital health experts and health informaticians. Stay in touch for more info: Follow @MedInfo2021 and subscribe for updates HERE. Check out our pitch video HERE ! 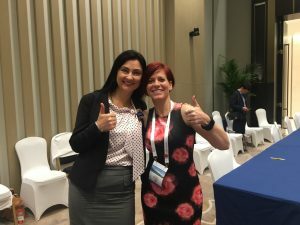 Renee Hall from Business Events Sydney and Dr Louise Schaper get the good news in Hangzhou. HISA CEO Dr Louise Schaper sells Sydney – and HISA expertise – to IMIA.